Incidentally, the ward is not for her illustrious music career that has impacted the world but for her humanitarian work. 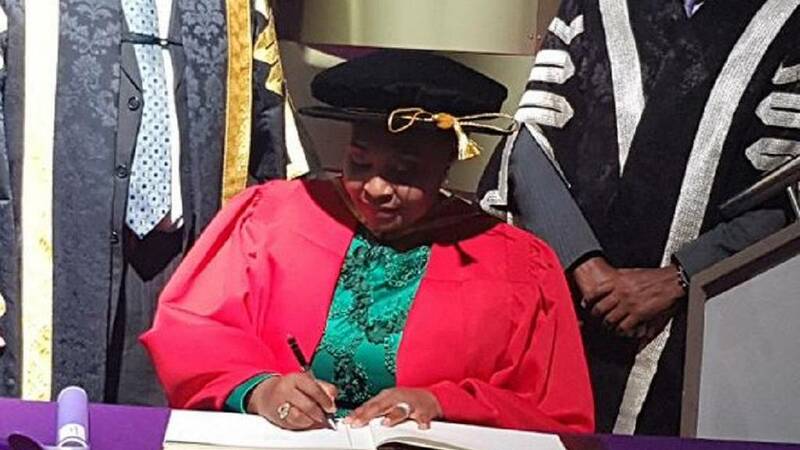 African music icon, Yvonne Chaka Chaka, has been awarded an honorary degree by a top South African public university – Rhodes University. The 53 year-old born in Soweto, beyond her music and humanitarian work is also known to be an entrepreneur and a teacher. She sang three of her songs during the ceremony where she was honored along with a top judge, Justice Dikgang Moseneke. “The Degree of Doctor of Laws (LLD) (honoris causa) in recognition of your sustained, extensive and wide-ranging humanitarian work. This work includes your role as a Champion of the Global Fund to fight AIDS, TB & Malaria,” the university said. Among her big tracks are “I’m Burning Up”, “Thank You Mr Dj”, “I Cry For Freedom”, “Motherland” and the ever-popular “Umqombothi” (“African Beer”). The song “Umqombothi” was featured in the opening scene of the 2004 movie Hotel Rwanda. She has shared the stage with persons such as Bono, Angelique Kidjo, Annie Lennox, Youssou N’Dour, South Africans greats like Johnny Clegg, Miriam Makeba and Hugh Masekela, to name a few. She has performed for Queen Elizabeth II, US President Bill Clinton, South African President Thabo Mbeki and a host of other world leaders.